How to decide which of your patients will benefit most from adopting an low-carb or keto diet? How to introduce it in a supportive and respectful way? This guide helps answer those questions. How do you decide which of your patients will benefit most from adopting a low-carb or keto diet? How do you bring it up in a supportive and respectful way? Moreover, how do you fit giving low carb information and counseling into a short 10-minute medical appointment? We all know that getting patients — or anyone — to change behaviors can be very hard. How can you effectively motivate patients to adopt significant changes to their diet? This section of the training guide helps answer those questions and gives you some tips and skills from other low-carb doctors about ways to engage and empower your patients to adopt low-carb or keto eating. For many low-carb doctors this aspect of patient care now is the most rewarding part of their medical practice. What used to be challenging, frustrating and demoralizing — chronically ill patients who only got worse, never better — is now inspiring, energizing and joyful. Instead of upping doses and adding more medications, doctors treating patients doing low carb are reducing drug dosages or removing them entirely. Patients who adopt the changes come into appointments excited, pleased and empowered. As UK physician GP Dr. David Unwin notes: "They are now my absolutely favorite patients. I am having cheerful conversations with previously unhappy people. Using ‘lifestyle medicine instead of lifelong medication’ can help patients really take control of their health, leading to greater doctor and patient resilience." Unwin has won a UK- National Health Service "Innovator of the Year" Award for his revolutionary work reversing type 2 diabetes in now hundreds of patients. He has created a highly-rated, 16-part video course for doctors with Diet Doctor. He reviewed this module for his input on effective patient engagement techniques. Many people report significant improvements with other health conditions using low-carb or keto diet, but currently evidence is anecdotal or preliminary. It is not known whether reported improvements may be due to weight loss, hormonal factors, or other effects of ketones. It may be worth saying to patients, however, "This might help, would you like to try?" Have family histories or confirmed risk factors for future chronic conditions such as type 2 diabetes, cardiovascular disease or metabolic syndrome. Have a strong interest in healthy living or adopting healthy habits, improving athletic performance. Have an interest in cooking and a desire to understand emerging nutrition trends that can improve their health and the health of their family. Are the spouse or partner of a patient or the parent of a child who might benefit from low carb and who needs to understand and adopt the diet to support their loved one’s health goals. The ideal time to talk with patients about trying low carb or keto is when they are in your exam room. Either you are giving them some new medical results or they are sharing a symptom that is distressing or frustrating for them. This is a prime time, a golden opportunity, to discuss health issues and motivation to try some new options, specifically changes to their diet. New lab results such as a recent blood test that shows pre-diabetes, a new diagnosis of type 2 diabetes, worsening blood glucose, high inflammatory markers, elevated androgens of PCOS, or elevated liver enzymes suggesting NAFLD etc. Weight gain since their last appointment, despite efforts to lose weight using other unsuccessful methods, such as calorie restriction and exercise. Change in medications for any of the conditions that can respond to low carb, whether it is increasing doses, writing a new prescription, or adding another medication. An unhealing wound, such as a foot or leg ulcer from diabetes, perhaps one that needs antibiotics or has not responded to antibiotics. Troubling symptoms such as joint pain from excess weight or inflammatory conditions; irritable bowel syndrome; amenorrhea, weight gain or hirsutism from PCOS. Even some of the conditions for which there is preliminary evidence —acne, sleep apnea, migraines, heart burn, mental health conditions —patients may be very eager to try using low carb. Concern over the cost of medications that may have patients wanting to consider more affordable options. Supporting a loved one who is receiving treatment or having health issues in which, as a spouse, partner, or parent, their understanding and support of the diet may greatly contribute to their loved one’s health success. A common way for doctors and patients to relate, in the past and even to the present day, has been through one-way interactions where the doctor, the 'expert', tells the patient what to do. The patient is expected to just go away and do it. These commands might take the form of: "Take this medication", "Stop smoking", "Reduce your alcohol," and now with low carb: "Cut out sugar, starches and refined carbohydrates and up your healthy fats." Often this information might be delivered in a lecturing or even forceful way to scare the patient with a dire prognosis unless they take the advice: "If you don't lose weight, you are going to have a heart attack." "If we can't get your diabetes under control you will lose your feet" …. "Now go and do as I say!" This approach may work for some patients, particularly from older generations who may be more apt to adopt the attitude of "You are the doctor, tell me what to do!" Your knowledge of your patients' personalities and needs may help you decide whether this might still be the best approach for any particular patient. Evidence is mounting, however, that almost all patients, of any age, are more motivated, inspired and empowered to take control of their health, especially where significant behavioral change is involved, by a more collaborative coaching approach. This approach taps into their own hopes and desires, treats them as equal partners, giving them the self-confidence that they have the skills, resilience and ability to make the change that are right for them to work in their daily life. "If we threaten patients, “Do this or else“; many close down and maybe not come back for five years. If we give them hope, by starting to talk about a better life it can be so much more motivating. For example try inviting them to think about a health goal that matters to them personally. For you, as a doctor, it may be to get their HbA1C down, but perhaps they don't care so much about that. Their goal may be to be able to play with their kids, breath better or lose weight. Then a great next question could be ‘what difference would losing weight make to your life?' This question helps the patient think more realistically about a preferred future. Only then do you work with them to help decide the steps they can take to achieve their goal" says Dr. Unwin. This style of collaborative interaction for has many different names and slightly varying approaches, such as life-style coaching, behavioral counseling, and motivational interviewing. Many resources exist, including more than 3600 published journal articles, videos and organizations that demonstrate and evaluate the effectiveness of motivational interviewing and give specific tips and techniques. Granted many of these behavioral change resources, over the last two decades, have been used to promote the old behavior change dogma of "eat low fat" "eat less, move more" or other aspects of the dominant "calories in- calories out (CICO) " model. The evidence and validity of this approach to patient engagement and empowerment, however, is strong, even if some of the CICO information shared was not very effective. Engaging patients with low carb information in this empowering style has the potential to achieve even better, lasting results. Collaborative partnership: you and the patient identify shared goals and work together to identify the realistic steps he or she can take to achieve those goals. Empathy: you recognize and are compassionate towards the patient's struggles and previous experiences and are non-judgmental about any actions and choices. Respect: you recognize and support patients' autonomy and other positive characteristics and resources they bring to their own issues. You do not shame or lecture them. Patient permission: you ask patients' permission to proceed in discussing certain areas. These are question like "Would you like to hear more about a few changes you might make…? "; "Do you want to hear about other options….? "; "Can I talk to you about some lifestyle changes that might help…?" Open-ended questions: once permission to proceed is given, the questions you ask should encourage patients to talk about how they feel, what they want, what they can do, and not elicit simply a yes or no answer. Get them talking with questions like: "How does that make you feel…?" "What do you think about that?" Affirming abilities: give statements and gestures that recognizes patients' strengths and acknowledges positive behaviors, no matter how big or small. Affirmations build confidence in patients' ability to change. "That is a great suggestion….." "You did really well with that…." The affirmations are even more important when the patient comes back to see you in a few weeks. "You have made great progress….". Reflective listening: hearing what patients tell you and then paraphrasing it back to them shows you are listening. Such attention can move them in a positive direction. "I hear you saying that …","What you just told me is ……"
Summarizing next steps: Summing up what you talked about in the appointment can provide the patient with a concrete and clear list of actions he or she can tackle. Summations also clarify anything not understood and provide transition and closure to the appointment. "So we’ve decided that to help you get your diabetes under control, you are going to go home and….." As you list of the actions the patient and you have agreed to you can ask. "Is that right? Do you have any questions?" Most doctors find it much easier to talk about type 2 diabetes and other clinical diagnoses like PCOS or IBS with a patient than to initiate a discussion about a patient's excess weight. "It can feel rude or impolite to talk about their obesity, so doctors may avoid even bringing it up, " says Dr. Unwin. The respectful approach that Dr. Unwin uses to bring up weight issues is to first listen to patients and their symptoms. Hear how they are telling you about sore knees or feet, their fatigue, their difficulty catching their breath climbing the stairs and other symptoms that may be related to their obesity. After you have heard their symptoms, ask permission to talk about their weight. "Do you think your weight may have something to do with your sore feet?" If you get even a head nod, then ask, "Would it be all right if we talked more about that? I have some ideas that might help…." Once you have permission to talk about their weight, you can then use the various principles outlined above to go into a more collaborative, patient-focused discussion about their goals for weight loss, what methods they may have tried before, how low carb principles might help them, and then define with some tangible low carb steps that they might be motivated to take. In depth information about the low-carb or keto diet for patients now abounds. It is possible to spend endless hours exploring resources, watching videos, listening to podcasts, learning about the physiology of fasting blood glucose, insulin response, gluconeogenesis, the misguided war on fat and more. Some of your patients may be the sort of people who want to explore the topic in all its depth — so have a handout ready that lists some reliable websites, like dietdoctor.com, and resources for more information. But you as their physician may not have the time to go into all that detail. With perhaps only about 10 to 15 minutes for the appointment, it is important that you get to the heart of the matter quickly and simply. Many low-carb doctors have found that relating how carbohydrates behave in the body using the glycemic load as equivalents of teaspoons or cubes of sugar makes a powerful, memorable and actionable explanation for a patient in a very short time. Most patients understand that sugar is not good for them. Many have even cut added sugar out of their lives in the form of no longer adding it to coffee, tea, cereals, grapefruit and other obvious applications. Most, however, do not understand how carbohydrates, upon digestion, break down in the body into surprising equivalents of teaspoons or cubes of sugar. Some low-carb doctors keep a big jar of sugar cubes in the exam room and ask patients to estimate how many cubes are in their morning cereal, bagel, and glass of juice. How many cubes are in a piece of brown bread, a bowl of rice, a baked potato, or a plate of pasta? A simple act of physically adding a number of cubes to their underestimates can drive home the message that carbs, as they break down with digestion, act like sugar in their bodies. 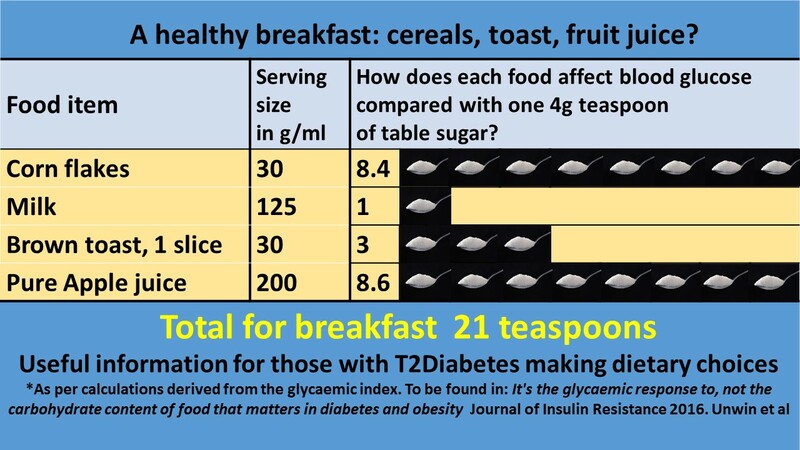 Dr. Unwin and other low-carb doctors in the UK have created powerful visual aids, available through the Public Health Collaboration, that shows how common carbohydrate foods break down into teaspoons of sugar. These guides are available for doctors to download and use in the office. One look at the infographics and the patient usually quickly gets the concept. Please find below an example. One egg is zero teaspoons of sugar. By quickly estimating, with the visual guide or with a jar of sugar cubes, how much sugar they are consuming from carbohydrates, you can dramatically demonstrate the impact carbs are having on their blood sugar and show how easy it may be for them to reduce their sugar load. For example by showing them that their daily breakfast of juice, cereal, milk and a piece of toast has 21 teaspoons or cubes of sugar, you can then show them how bacon and eggs with black coffee has zero. Easy change. Some patients will immediately understand the sugar comparison, but they will be stuck on the what they should eat instead. Ask them what they typically eat in a day, and give them an easy substitution. If breakfast is usually cereal, juice, and toast suggest eggs, bacon, and coffee (with heavy cream, if wanted) instead. If lunch is a sandwich with deli meat, how about salad with sliced chicken or steak instead? If dinner is often a meat with a starch like pasta, potatoes, or rice, tell them to have as much meat as they like, but eliminate the potatoes, pasta or rice and fill the rest of the plate with green vegetables or salad. If between meal snacks or after meal desserts are stumbling blocks, recommend eliminating the soft drinks, junk food and sugary desserts but feel free to drink sugarless tea, coffee or water and, snack on nuts and cheese. For dessert have berries and unsweetened whipping cream or full fat yoghurt. Not every patient needs to adhere to a strict low-carb diet to achieve their desired results. Generally, however, the lower the carb intake the more powerful the results. People with type 2 diabetes or metabolic syndrome may do best on a very low-carb diet below 20 grams of carbs per day. Advise them to sign up for the Diet Doctor two week low-carb challenge. Most low-carb doctors find that patients do best by jumping in with both feet and reducing their carbohydrates immediately (but please bear in mind any current medication they are taking). This seems to be the easiest, all or none, way to manage. Patients often report that, except for perhaps a short bout of keto flu, they almost immediately feel better and notice significant results. This motivates them to continue. These patients will move generally move from success to success. Some patients, however, are not ready to do a strict low-carb diet, but may still benefit from some carbohydrate restriction. Encourage your patients to make small changes to build results, such as cutting out sugar in tea or coffee or reducing refined carbohydrates. A little improvement may then motivate them to make more significant changes in the long run. not adding sugar to coffee or tea. These initial changes may have a positive impact on their blood sugar, their blood pressure and their waistline and leave them motivated to try more. Once they see positive changes, at the next appointment you can talk about building on their success. Eliminate snacks containing starches and grains, such as chips, nachos, pretzels, popcorn. Ask them to name their favorite snacks. Discuss which ones have refined carbohydrates (some patients won't know.) Suggest other snacks such as nuts, seeds, olives, cheese and meats. Eliminate starches and grains from their breakfast. If they usually start their day with a bowl of cereal or granola, or have toast, a pastry, or a croissant, suggest they stop and switch to bacon and eggs. This is an easy meal to explain why eating foods that rapidly turn to sugar is not a good idea. Explain morning blood sugar highs. Many patients, particularly those with diabetes, know that blood sugar is highest in the morning. Eating food that converts to sugar first thing in the morning makes blood sugar even higher. Tell them it is like “pouring gasoline on a fire” to add more food that converts to sugar at this meal. They will understand this. Focus on what they can easily control. Most patients eat breakfast at home and have more control over their morning food options than they do at lunch and dinner. Suggest bacon, eggs, sausage at breakfast. This may feel decadent and indulgent to them. Tell them it is good for them. Reduce or eliminate starches and grains in their dinner meal. After eliminating carbohydrates at breakfast, the next step is to encourage patients to eliminate them at dinner. Most people make their dinner meals at home and have a lot more control over what they are eating. Also, let them know it is more detrimental for them to consume carbohydrates and less likely they will burn off the sugar before bed time. Reduce or eliminate starches and grains in their lunch meal. This last action can be the most challenging for patients. Quick options for low-carb lunch items may be difficult to find. Most cafeterias or restaurants cater to the traditional food pyramids with significant portions of carbohydrates. This may add stress to a patient who has a hectic workday and lacks the time to prepare lunch meals at home. Suggest possible quick choices such as fast food meals of burgers without the bun, unadorned chicken wings, salads with meat and no croutons, deli meats with cheese but no bread. Once a patient develops stronger low-carb eating habits, lunch options will be easier for them to manage. Measure and record their weight. Remark on any positive results. Measure and record their waist. Show them the before and after tape measurements and congratulate them on any positive change. Track measures like fasting blood glucose, HbA1c, liver function, triglyceride and HDL. Can you make graphs to print it out for them to take home? Congratulate them on progress. Sharing results with them and celebrating their successes keeps patients motivated to continue. Bear in mind the potential of hypoglycemia of going low carb for someone already on diabetes medication; dosages may need reducing or drug stopped altogether. Insulin is the obvious example but there are others. Metformin is safe in the context of a low-carb diet. Insulin causes sodium retention at the kidneys and this in turn can affect blood pressure as a lower carb diet may lower insulin levels. This may lead to a lower blood pressure – especially if the patient is on medication for blood pressure – so monitor BP. In fact many patients are able to reduce their BP drugs. For the same reason, some patients need more dietary sodium or they get muscle cramps. Magnesium supplements may also help with this problem. Occasionally a type 2 diabetes patient goes low carb and loses weight but the blood glucose and HbA1c do not improve. Are you sure it’s not a misdiagnosed case of insulin dependent or type 1 diabetes? Remember that improvement in diabetic control is not the only cause for the HbA1c to drop. Anemia is another – so it’s probably better to measure the Hb along with the HbA1c. It’s important to add that no one diet will suit everyone and there are other approaches like the very low-calorie diet (VLCD) that also may help. This is where relevant information and patient choice comes in. The above information and approaches can work for almost any patient with a diagnosis, symptoms or complaint that has evidence for results using an low-carb or keto diet. As doctor, you will soon feel on very safe ground entering into discussions with patients whose predominant issues are type 2 diabetes, obesity, hypertension, or PCOS. For other health concerns, it can feel more risky and unconventional to engage with patients in this manner. How much you decide to do so will be in direct proportion to your comfort with the diet’s potential to help your patients. The more you see your own patients thrive on it, the more comfortable you will be suggesting it to others. Do remember, however, patients are partners who deserve to be afforded the option to try low carb for their symptom or complaint. If you might happily suggest a trial of low carb to a family member or friend, consider suggesting it to a patient. For a patient with a condition where some anecdotal evidence, but not yet strong randomized control trials, perhaps pose it this way: "This approach may help and likely won’t hurt. Would you like to try it and together we will see what happens?" Your patient with acne, migraines, joint pain, fibromyalgia, chronic fatigue, depression, sleep apnea and other undermining conditions may be very motivated to try. By following their progress and supporting them you may be able to, at least, remove from their diet highly processed, refined carbohydrate foods to replace it with more wholesome options. Better health, even if it does not completely resolve all their symptoms, may easily result. In recent years, the scientific literature has demonstrated some potential for strict low-carb diets to help improve certain types of cancers, in conjunction with traditional medical treatments such as surgery, radiation and chemotherapy. A growing body of research suggests that restricting carbohydrate intake in order to lower blood glucose and insulin levels may slow tumor growth and maybe starve cancer of the key fuel, glucose, that it needs to grow. However it would be fair to say as yet this is a contentious area. Cancers such as brain cancer and breast cancer have been the most researched cancers in humans. Ketogenic diets have been shown to reduce the progression of several types of cancers in mice studies. Below you’ll find some of the research studies that support the potential role of a low-carb diet as an adjuvant treatment for certain cancers. However, this is still an early and unexplored research field. Much more research is needed to know what role, if any, a low-carb or keto diet might have in the future of cancer treatment. Nutrition & Metabolism 2011: Is there a role for carbohydrate restriction in the treatment and prevention of cancer? Other diagnoses, such as multiple sclerosis, amyotrophic lateral sclerosis, Parkinson’s disease, mental health conditions, and Alzheimer’s disease, do not yet have a strong research base. Yet preliminary research on low-carb or keto diet applications suggest it may offer a glimmer of hope. As a physician, you may find that discussing the option to try low-carb or a keto diet may provide a modicum of control and choice to a patient who feels bereft of options. Again, entering into an honest, empathetic and collaborative conversation may help your doctor-patient relationship. There are no guarantees. But it starts by asking:"There is a possible, rather new, option. It might help a lot. It likely won't hurt. Would you like to try?" When starting the Low Carb Keto diet, to include intermittent fasting, how long before one can reduce insulin units? I started Keto recently and reduced my insulin intake almost immediately. After experiencing keto flu, my BS levels went from 264 to 192 within less than one week. I feel fine now but am I hurting myself? I do a 12-13 hour fast every night and I basically consume an average of 40 grams of carbs a day. I have lost five pounds but I must reduce the amount of diet soda I drink. I believe I will lose more weight without it. Would appreciate you guidance and input. You need to work with your medical provider to adjust medicine dosages. I have a question about losing weight. I just started my second month of journey, the first month I have lost 10LBs, from 150.8 to 141.8lbs. then the second month started, I found that I gained back 2 pounds. I am not sure what's going on. I am not counting calories, but I do watch what I eat, normally eggs with cheese, avocado , sometimes chicken meatballs with salads. I am really having a low carb diet. I guess I need some advice, does anyone actually experienced like me? should I adjust my diet plan or stick to it and give it sometimes? The important thing is keeping carbs low. If you are not seeing success, make sure you're under 20g carbs per day and getting plenty of fat. Check out our two week challenge if you'd like 2 weeks of meal plans sent to you as well as our many awesome recipes. I am 44 year old who is trying to lose 25 pounds of weight which is mainly in my abdominal area.I started with a weight of 186 pounds on a 5.6 height. I have recently started following a low carb diet. My current weight is 174 pounds after 3 weeks of dieting . My concern is that I get blurry vision usually 2-4 after meals and get irritable and anxious. Eating relieves some of symptoms. I wanted to know if this is normal in low carb diet. I workout with weights 2 times a week and walk 30 mins twice a week. I have not been diagnosed with diabetes. I don’t take any other medication except ambien for sleep. My carbs although low are still around 70-80 grams a day.